The days of hot. Sweaty hikes through the White Mountains, swatting at flies in Northern Maine, and filthy backpacking trips through Vermont mud are the adventures (or misadventures) on the agenda. But with every day that the temperature rises, the more and more comfortable it becomes to enjoy New England’s favorite summer respites: swimming holes. The Northeast is defined by a web of lakes, rivers, and streams coursing from its inland mountains toward the Atlantic, meaning there’s no shortage of places to take a dip after a long day on the trails. While there are a ton of swimming holes to choose from in New England, these 12 natural pools make for the ultimate summer relief. 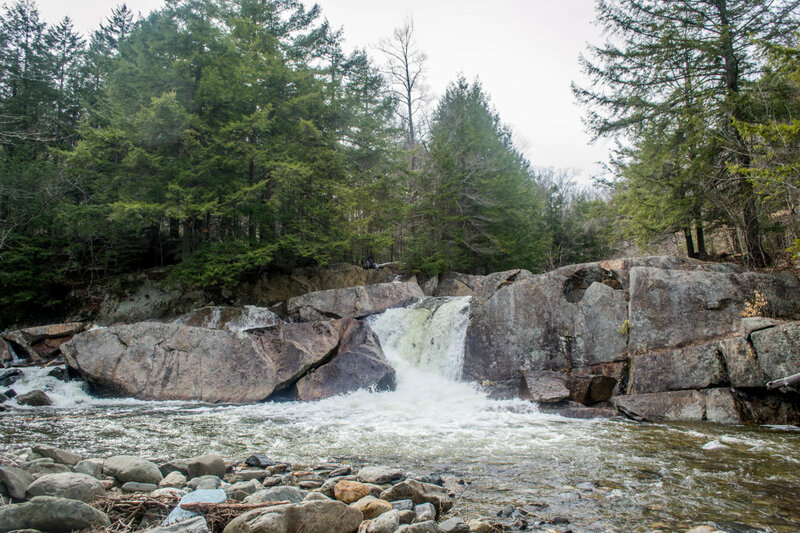 Franconia Falls is tucked in the core of the Pemigewasset Range, but an easy and flat 3-mile hike along the East Branch of the Pemigewasset River and Franconia Brook will set you up at one of the area’s premier water parks. The water here runs over and through a series of sunny slabs, creating a variety of pools to explore. The best part, though, are the two waterslides formed in the rock, one of which shoots you down about 20 feet to a deep pool. 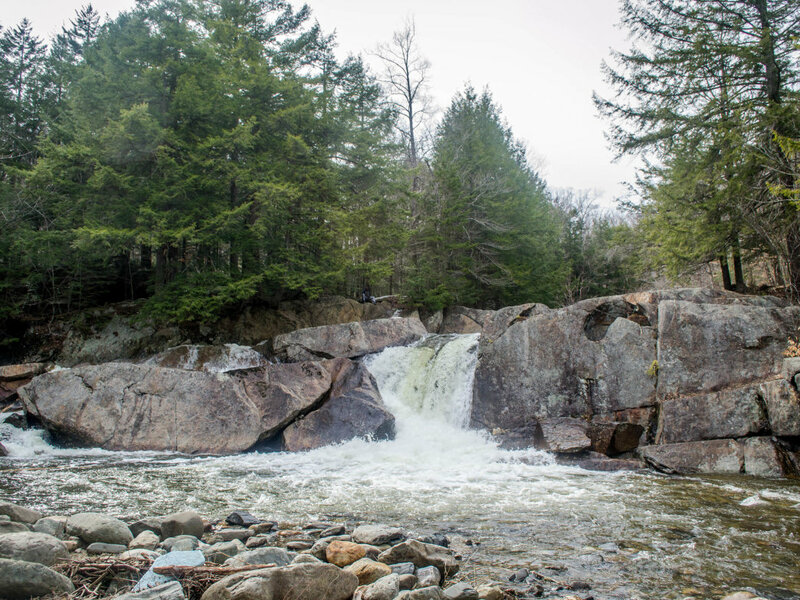 While Franconia Falls is a day trip on its own, Lower Ammonoosuc is the perfect pit-stop after a day hiking in the Presidentials. Just a few steps away from Lower Falls Road off US 302, the low-angle drops and pools here are ideal for everything from soaking your tired feet to sitting in water up to your chest, beer in hand. Hiking beyond Franconia Falls, farther into the Pemi Wilderness, will eventually bring you to secluded Thirteen Falls, a series of waterfalls up to 30 feet tall with cold pools at their base. The Appalachian Mountain Club’s Thirteen Falls campsite sits right next door, making the falls at the end of an 8-mile hike the perfect overnight destination. The 25 foot drop at the waterfall end of Frenchman’s Hole is a perfect diving board for thrill-seeking swimmers. The water that fills the hole at its base can be upwards of 10-feet deep, and the steep, smooth cliffs surrounding the water make it feel like a Maine Woods hideaway. An upper pool is a little shallower and better for small kids. And it’s all just a short walk from Sunday River Road. At the bottom of a series of small cascades, Huston Brook features a huge pool of frigid cold, emerald green water. Shallow and sandy, it’s a great place for kids. Dry off by clambering up on the rocks surrounding the water. Follow Huston Brook Road near the Sugarloaf Ski Area to a parking area and a short trail down to the falls. This tiny pothole is more like a hot tub than a pool, except that it’s frigid cold. The 1 mile hike from Shell Pond Road leads to a small tub surrounded by moss and trees enough to make it feel like a secret tropical oasis. You’ll get your money’s worth here. Enders Falls is a set of five waterfalls up to 30 feet tall, all within a half-mile stretch. The third drops to a series of ledges and a refreshing pool for wading into, but pools farther down the short trail from Route 219 are likely to be less visited. Warren is a local classic. Right off Route 100, the roomy pool is a favorite for cliff jumping, with options running the gamut in height up to 20 feet. It’s likely to be crowded on summer weekends, but this is one hotspot that’s worth making new friends for. Compared to most natural pools, Bartlett Falls feels large enough for an Olympic swimming competition. Just a short walk from River Road, the falls themselves cascade over a ledge with an alcove behind the curtain that you can explore. But the 120-foot long pool is deep enough to fully submerge yourself, and large enough to swim laps. Buttermilk Falls is a series of three 15 to 20-foot fall waterfalls, with dark green, pebble-bottomed pools beneath the first and last, just deep enough to get completely underwater in. Surrounded by dry rocks, it makes for a fun jungle gym for kids. The short hike begins at the end of Buttermilk Falls Road. A 12-foot water slide, flat sunny slabs and a 7-foot deep pool make this a hidden Massachusetts gem. A shallower pool upstream from the main area is great for sitting and relaxing. Find it just a short walk from Route 57. The falls themselves are tiny, but the pool beneath is great for cliff jumping and swimming and relaxing in the rocky water, surrounded by hardwoods. Upstream, several small pools are good for splashing or just dipping your feet. Follow a path from the Bellevue Cemetery down to the water.